Chronically itchy dogs make up a large portion of my practice. Many people come to me for alternative ways to help control the itch. 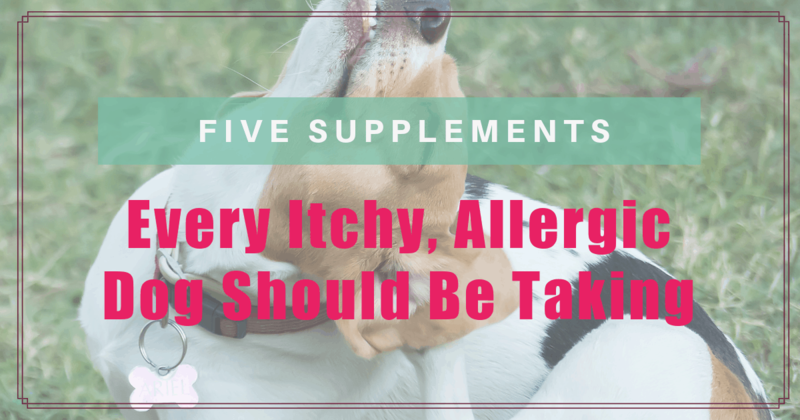 Here, I have compiled a list of five supplements that can help support allergic dogs. It is important that you work with your veterinarian to help diagnose and treat your dog properly. These supplements alone will most likely not be enough to stop your dog’s itch. Combined with diet and regular veterinary care, these supplements can help improve your dog’s itch. 1. Omega Fatty Acids. This is a no brainer. Every dog should be on an omega 3 fatty acid supplement. Omega 3 fatty acids have been shown to help decrease inflammation and benefit organ function. For some itchy dogs, this all they need to drastically improve their itch. Giving your dog omega 3 fatty acids can significantly reduce the amount of steroids that it will take to eliminate biting, scratching and chewing. Fish oil, krill oil, and green-lipped mussel are all great sources of omega 3 fatty acids. 2. Probiotics. While probiotics don’t directly stop your dog from scratching, they do promote gastrointestinal health. Having a good population of healthy bacteria in the gut of your dog can drastically reduce and prevent allergies. 3. Quercetin. This is a bioflavonoid and is often referred to as ‘nature’s Benadryl’. This supplement is usually paired with bromelain and is thought to have synergistic effects when used together. 4. Magnesium. It is thought that magnesium can help reduce allergic inflammation. While this may or may not be true, magnesium’s real benefit is calming the nervous system and reducing anxiety. Many dogs with chronic allergies suffer secondarily from anxiety. I generally recommend magnesium citrate. However, magnesium glycinate may also be used. Dose 10 mg/kg given once daily. Recommended Brand: While I personally use Pure Encapsulations, there is an abundance of options for this particular supplement. 5. L-theanine. This is another great supplement to control anxiety. L-theanine works by increasing serotonin and therefore increasing your pup’s overall sense of well-being. Many dogs continue to bite, lick and chew past the resolution of their allergies due to chronic stress and anxiety. Remember to work with your veterinarian before starting your dog on any new supplement or diet. I would love to hear from you! Leave a comment below! What weight is considered small and medium? Hi Anne! I have updated my article to reflect these parameters! I was wondering if you can get these supplements in one pill? That would be great! I don’t know of any formulations with all of these together. I am so sorry! Can you put them in something tasty like a slice of turkey or cream cheese? Can these supplements help my 5 year-old cat that has developped red bumpy scabs on his tummy and hind legs? He’s scratching and licking all the time. He was precribed prednisolone which helps but not for long and I don’t much like giving it to him. I am so sorry to hear about your kitty! I find that kitties that have itchy skin are often allergic to food. Have you tried any food trials? I gave my dog Quercetin and after a few days he started immediately throwing up while eating it in his food. Needless to say, I am not giving it to him anymore. I am so sorry to hear that your pup did not tolerate the Quercetin well! Definitely a good idea to discontinue it! Hi! Would Mag Ionized be a good choice for dogs? I found An Ionized Mag solution containing 300mg Mag and 400mg Malic Acid … Pls advice. Thanks! Magnesium can be helpful it certain situations. It can cause diarrhea when given in too high of a dose, so always start small. I know that … from own experience. Thanks! I was just wondering whether the other ingredients might be toxic to dogs and which kind of Mag would be better absorbed. Update… I did order the Nutricalm, but it seemed to make him worse in so far as his excitability when people or vehicles walked/drove by our place. Oh no! I am so sorry to hear this! How have things been going since this post? Oh my goodness, I am so sorry. I know that this is so stressful for you both. I’m so glad that the medications did help rescue your pup from the extreme itching. Another thought is to visit a veterinary dermatologist. If these allergies are largely environmental, they may be able to help with immunotherapy! 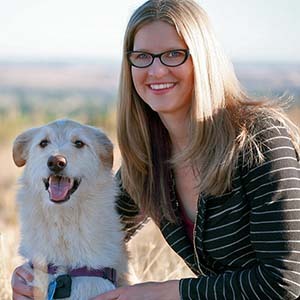 I’m hoping you find a solution that not only helps your dog’s allergies, but also feels like the right approach. Managing allergies can feel so overwhelming, and you are doing a great job! We do not know of any negative interactions with using Prednisone and Quercetin together. It may take up to a couple of weeks to see the Quercetin begin working. Thank you so much for your help. Will get her started on the quercetin! You are so welcome! Keep us posted on everything!